Honoré Daumier, Ne vous y frottez pas! !, 1834, lithograph on paper, 30.7 x 43.1, Delteil 133. The tragic events in Paris on 9 January 2015 when cartoonists were assassinated by Islamist fanatics brought to mind one of the great artists of the 19th century, Honoré Daumier. It may be assumed that freedom of the press is one of the fundamental freedoms in France but such was not the case until 1881. 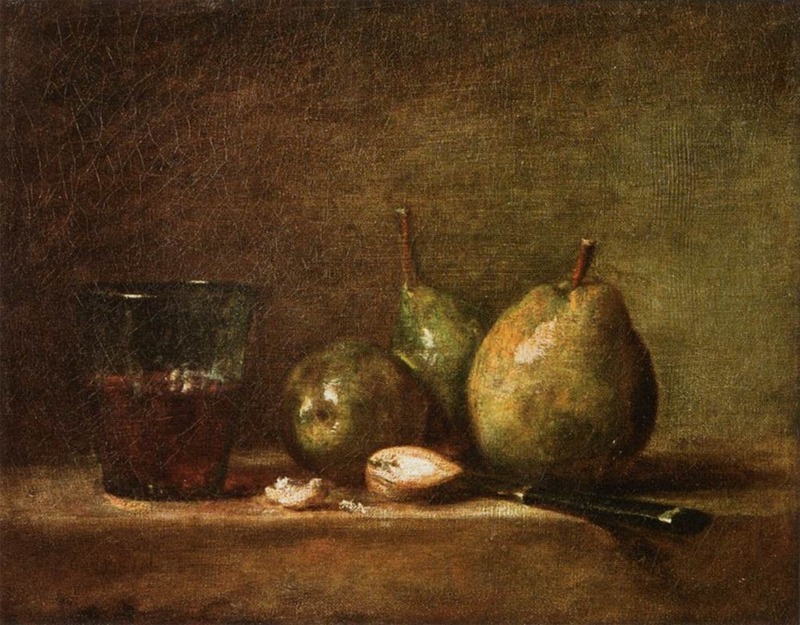 By then Daumier had died. If freedom of the press was part of the original Declaration of the Rights of Man and of Citzens in 1789, this was set aside in 1792 as the revolution evolved into the reign of La Terreur. The political régimes that followed, the Empire, the Restoration, the July Monarchy and the Second Empire, all suppressed freedom of the press to a greater or lesser extent. Only in the early days of July Monarchy was there some press freedom, but this was short-lived. 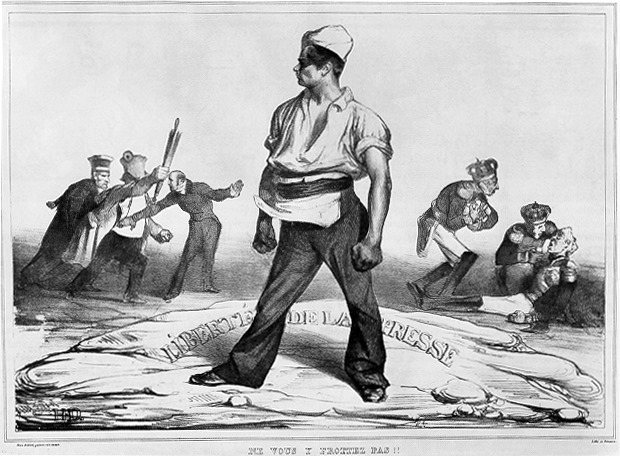 Republican feelings opposed the Monarchists who dominated French politics until the Revolution of 1848. The Bonapartist Second Empire, established in 1852 also suppressed press freedoms. Daumier was imprisoned for 6 months in 1832-33 for his cartoons. 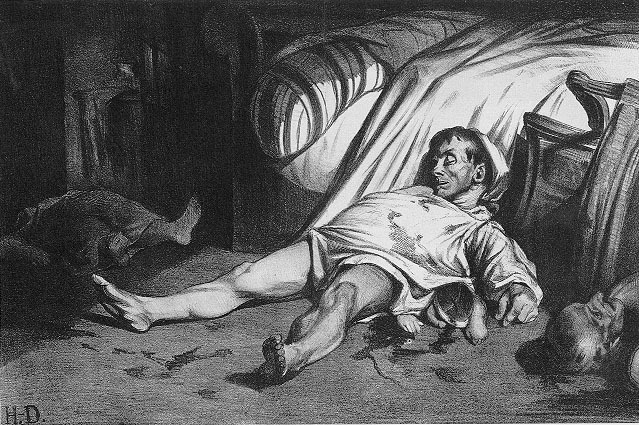 One of Daumier’s most devastating lithographs was his Rue Transnonain, 15 April, 1834. 33.9 x 46.5 cm. The event depicted is the brutal repression of insurrectionary elements that year. In response to a sniper from an apartment building on Rue Transnonain, the government’s soldiers broke into the building and massacred all the inhabitants. Daumier’s lithograph appeared and was shown in a shop window but quickly suppressed, with all available copies of the work seized. Press censorship was restored. Daumier would go on to produce many hundreds of lithographs and his commentaries on politicians and the judiciary appeared in various illustrative journals. Most of them had to be submitted to the authorities for approval. He was able to publish several caricatures of King Louis Philippe until the Revolution of 1848. 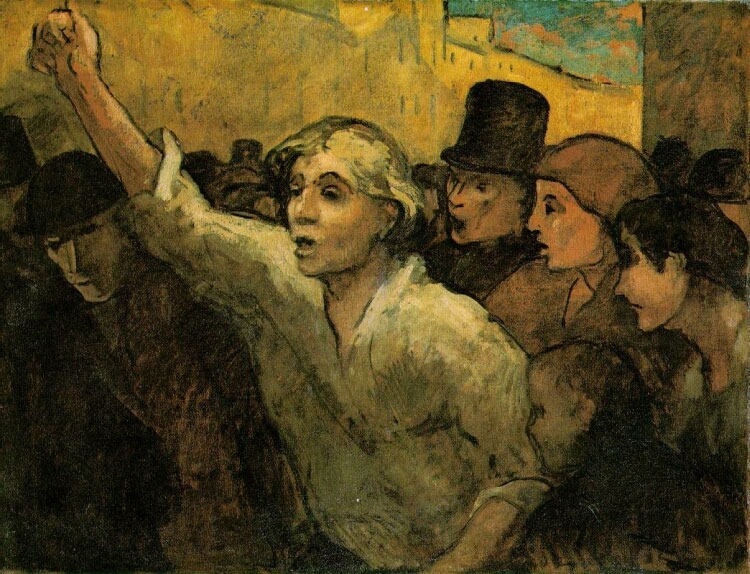 By then, Daumier was working as a painter and his image of The Uprising, c. 1849, (below – oil on canvas, 88 x 113 cm, Phillips Collection, Washington, DC.) captures the events of 1848, a year of revolutions all over Europe. For much of the 19th century, French governments suppressed many freedoms with violence against its own citizens. The climax of these suppressions was the state sanctioned massacres during the Paris Commune in 1870-71. Since 1881, when the freedom of the press was established by law during the government of the Third Republic, the principle has more or less held in France under successive Republican governments, notwithstanding repeated attempts to control or impose some limitations. If the principle is maintained in Canada and the United States, freedom of the press is always under threat. Many will have noted that during the same week that the events in Paris brought freedom of the press to light once again, the press is muzzled or controlled in many countries all over the world. The leaders assembled for the great March in Paris on 11 January 2015, it should be noted, were not marching for the freedom of the press, but against terrorism. In Canada and the United States, the corporate owners of the media, do control what gets coverage and what does not. This too is a more or less subtle form of censorship. During the first week of January, 2015, a young Saudi national, Raif Badawi, condemned for the contents of his blog, received the first 50 lashes in a public square in Jeddah. The sentence for his blog, apparently ‘insulting to Islam,’ is 10 years in prison and 1000 lashes, as well as a fine of one million riyals (about $266,000). His blog was critical of the powerful clerics in that country, one of the Arab world’s more repressive régimes. The punishment has been protested by many human rights organizations, including Amnesty International.